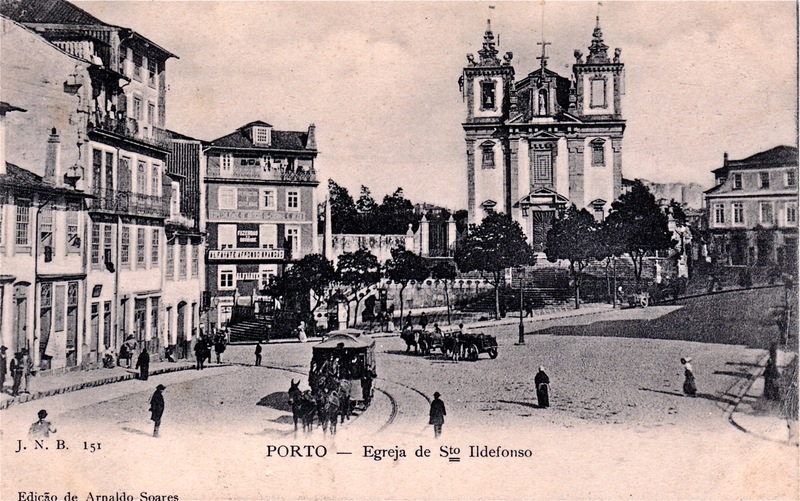 The Igreja de Santo Ildefonso was always a very popular subject for photos and postcards. Often a tram was in front of the church. This is the oldest postcard from my collection with such a scene. The photo shows a tram with four mules. The standard traction of these trams was two mules but likely two more were added to tackle the slope from Rua Santa Catarina to Praça da Batalha. The tram is on the route to Campanhã. This was the main line of the CCFP: Matosinhos (Rua Roberto Ivens) – Castelo do Queijo – Rua de Gondarem – Foz (Cadouços) – Campo das Ervilhas – Fonte de Moura – Avenida da Boavista – Boavista (depot) – Carvalhosa – Rua da Cedofeita, opposite direction Rua do Rosário – Carmo – Praça Dom Pedro (now Praça da Liberdade) – Rua Dom Pedro (does not exist anymore, but was about the east side of where is now Avenida dos Aliados) – Rua Formosa – Bolhão – Rua de Santa Catarina – Praça da Batalha – Rua Entreparedes -Santo Lazaro – Avenida Rodrigues Freitas – Rua Heroismo – Estação de Campanhã. Between Matosinhos and Boavista the traction was by steam locomotives, from Boavista to Campanhã mules pulled the trams. The detour via Bolhão was without doubt to avoid the steep Rua de Santo António (Rua 31 de Janeiro), which would have required a great number of mules. The line was for large parts single track and likely the tram is waiting here in a passing loop for another tram in the opposite direction.